"Montgenèvre is one of the best ski resorts I have skied. What could be better than empty slopes and the chance to pop over to Italy for an authentic pizza for lunch! 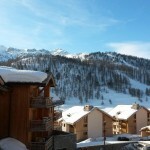 The views at Montgenèvre are just fantastic and with snow and sunshine, what more can you ask for." Montgenèvre is located high on top a historic pass on the French-Italian border (the same one Hannibal marched his elephants over) and is part of both the local Monts de la Lune (‘mountains of the moon’) ski area and the massive Voie Lactée, or Milky Way, ski region which stretches for 440km of lift-linked skiing in to Italy, making it one of the world’s biggest ski areas. Montgenèvre is excellent value for money on and off the slopes and provides an excellent option for families and couples alike who want to try a French/Italian blend. The resort has seen large scale investment in recent years, when it celebrated a century of winter sports by having the busy border road that used to divide the resort and the ski slopes, diverted through a tunnel away from the village to create a very pleasant, modern ‘snow front’ where new resort facilities meet state-of-the-art lifts, learning areas and snow fun sectors. The resort’s proximity to Turin (98km) and Grenoble (145km) airports, snowsure altitude, family-friendly facilities, modern accommodation options and great range of mountain restaurants are the icing on the cake. Based on two sides of the valley, the skiing in Montgenèvre is hugely varied with open bowls, long groomed pistes and the novelty of skiing in and out of Italy makes it all the more interesting. The long runs from the top of the Rocher De L’Aigle chair all the way down to the picturesque village of Claviere - across the border in Italy - are definitely a must and you can reward yourself with a great Italian lunch. Investment in fast chairlifts mean it’s quite feasible for intermediate skiers and above to go further in to Italy and up to the resorts like Sauze d’Oulx and Sestrière which were hosts of 2006 Winter Olympic events and offer still more world class terrain. But there’s plenty for all ability levels. A 50 hectare site right next to the village has been created especially for beginners with easy to use lifts, gentle slopes, expert tuition and cafes to collapse in to just a few steps away. There are hundreds of kilometres of intermediate terrain and for experts 18 black runs make up a tenth of the groomed slopes, the most challenging arguably the Rocher de l'Aigle descent.